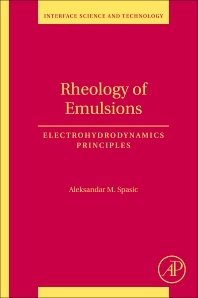 Rheology of Emulsions, Volume 22: Electrohydrodynamics Principles studies phenomena at liquid-liquid interfaces, including finely dispersed particles or structures, in particular emulsions, double emulsions and biological cells. The book considers the forces of electrical origin that participate in the physical events at liquid-liquid interfaces, taking into account electron transfer phenomenon and electrodynamics principles. Topics covered are of interest to a broad range of scientists, researchers and graduate students with a basic knowledge of physical chemistry, electromagnetism, fluid mechanics, classical and quantum electrodynamics. The implications and applications of the material presented in the book contribute to the advanced fundamental, applied and engineering research of interfacial electroviscoelastic phenomena. In 1992 Aleksandar M. Spasic obtained a Doctor degree in Chemical Engineering. His professional activities encompass basic, applied and development research in the field of chemical and metallurgical engineering, physical chemistry and inorganic chemical technology. He was chairman of the section Extraction and Leaching at the International Congresses of Chemical and Process Engineering. He (co)-authored several monographs and published articles in international scientific journals.